Google has created many incredible and intuitive products to make our lives easier. But at what cost to people’s privacy? They can take pictures of your house; they can track your searches and emails to bring you ads and information relevant to your habits and content, and much more. Jason Hartman welcomes Scott Cleland, author of Search and Destroy, on this episode to discuss the dark side of Google. Scott has been researching Google since its inception, as they bought their way to the top. “Google tends to think that doing good or being good is a license to do wrong,” says Scott. Google has created a huge degree of trust, but has the most outrageous legal, fraud, infringement, and anti-trust and privacy violations track record of all public companies. 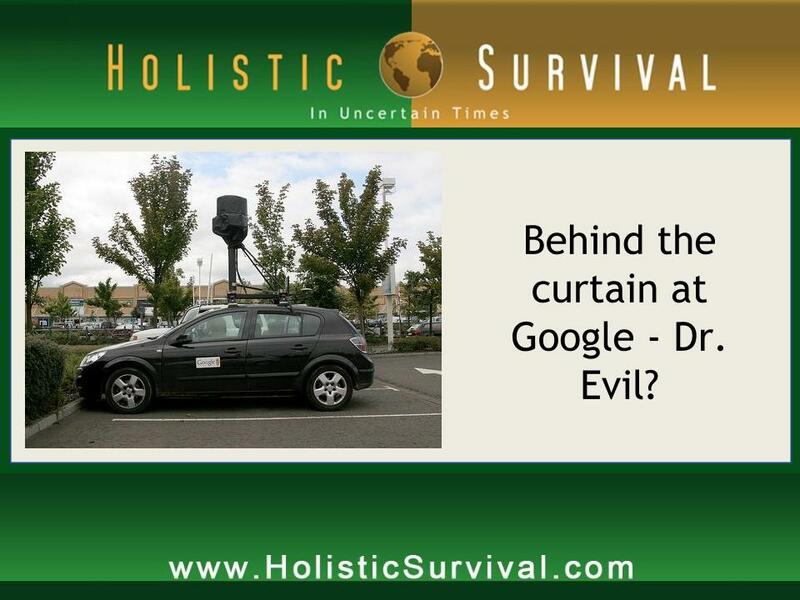 Scott shares some of the situations in which Google was participating in criminal activities. For more details, please listen at: www.HolisticSurvival.com. Google has obtained an incredible amount of power over online information. Jason asks Scott to explain Google’s relationship with the government. The U.S. government can obtain whatever private, intimate information that Google has without any warrant or subpoena. It boils down to a lack of security and an invasion of privacy. Scott says they know you better than your own family, online and offline, and the vast amount of information they collect puts people at risk. It seems so convenient that Google knows your search patterns, but is the convenience worth the loss of personal privacy? It definitely raises the security risk and proposes a conflict of interest. As Scott describes, anywhere there is a centralization of power, bad things happen. Scott Cleland is the world’s leading Google critic. Cleland has testified before Congress three times about Google. He publishes GoogleMonitor.com and Googleopoly.net, and authors the widely read PrecursorBlog.com. As President of Precursor LLC, he consults for Fortune 500 clients. A former #1 ranked Institutional Investor independent analyst known for spotting early on why the Internet dotcom bubble would burst, Cleland was also the first analyst invited to testify before Congress about the missed warning signs of Enron’s fraud and bankruptcy. Fortune profiled Cleland as “ahead of the pack in raising questions about WorldCom’s debt, profitability, and survival.” Cleland is a former U.S. Deputy Assistant Secretary of State for Information and Communication Policy. He lives in the Washington D.C. area with his wife and two children. Jason Hartman: Welcome to the Holistic Survival Show. This is your host Jason Hartman, where we talk about protecting the people places and profits you care about in these uncertain times. We have a great interview for you today. And we will be back with that in less than 60 seconds on the Holistic Survival Show. And by the way, be sure to visit our website at HolisticSurvival.com. You can subscribe to our blog, which is totally free, has loads of great information, and there’s just a lot of good content for you on the site, so make sure you take advantage of that at HolisticSurvival.com. We’ll be right back. Narrator: Now’s your opportunity to get the financial freedom report. The financial freedom report provides financial self-defense in uncertain times. And it’s your source for innovative forward thinking, investment property strategies, and advice. Get your newsletter subscription today. You get a digital download and even more. Go to JasonHartman.com to get yours today. Jason Hartman: My pleasure to welcome Scott Cleland to the show. He is the author of a book entitled Search and Destroy: Why you can’t trust Google Inc. And he talks a lot about Google and about how we are in essence selling our souls to come extent because the product is us. The payment we’re making is with our information. Certainly this is one of the most powerful companies on earth. It’s good to see someone be critical of it. So we’re going to explore that today. Scott welcome, how are you? Scott Cleland: Thank you for having me Jason. I’m doing well. Jason Hartman: My pleasure. Where are you coming to us from? Scott Cleland: Northern Virginia. Right outside of Washington DC. Jason Hartman: Fantastic and again as an interest of disclosure, I did mention this to you before, we are not using Google Voice to record this call, this show. So that’s good news. So tell us a little bit about what brought the book about and maybe a little bit about your background. Jason Hartman: Just a moment; let me just mention something. Double Click came under a lot of fire just about 10, 12 years ago as I recall for their abuse of information, right? Scott Cleland: Absolutely. But my concern was basically there were only two companies that had a dominant share of internet users, advertisers and websites. And it was pretty obvious to me as an analyst that if you put the number one and number two that both had really dominate shares together, it would be game over. So I worked with the FTC at the time very strongly and I testified for the senate and I told anybody that I saw that this is a really dumb thing to basically tip Google to monopoly. I’m a free market conservative. I think it’s great to compete and it’s not illegal to be a monopoly. It certainly is illegal to buy their way, and they did. So the federal trade commission totally blew it. So that was what really got me on them and then the more I studied Google, the more I realized even though they’re the world’s best search engine and they do enormous amount of good and have an enormous amount of good products and services, they tend to think that doing good or being good is a license to do wrong. And the more I studied them, the more troubled I was. And at court, the problem with Google is twofold. Number one they don’t obey the law. They don’t believe in other people’s property, and other people’s privacy. And the other thing is they claim to be very ethical and very moral. And the track record does not show it. They do not practice what they preach because it is extremely disturbing when you see how much trust they have created by representing themselves to be literally one of the most ethical companies in the world and morally superior to other corporations. And when you see their track record, their rap sheet, and actually I did a blog post this week, Google’s Rap sheet. It’s stunning how bad. There is no major corporation with as bad illegal, fraud, criminal, infringement and antitrust and privacy track record as Google. I mean it’s systemic. Jason Hartman: Yeah, pretty strong statements there from a company whose mission statement is don’t be evil. I think that’s the exact mission statement. So you say that actually ethics are one issue, and of course very important but those are subjective. But you say they’re actually breaking the law though. Actually doing illegal things. What are they doing? Scott Cleland: Well the most egregious thing that’s indefensible that they basically settled on, is last summer they agreed to a $500 million dollar criminal forfeiture penalty. Essentially for several years they were advertising and marketing and promoting actively illegal, unsafe prescription drugs from overseas. So that would be illegal steroids, illegal whatever kind of drug. And they were actively marketing them after they had been warned several times by law enforcement. And the Rhode Island US attorney that was prosecuting this case, basically said Larry Page, the CEO of Google knew what was going on. Jason Hartman: I didn’t even hear about that. Was that much in the media? Scott Cleland: Well the reason you didn’t hear about it was Google is masterful in its duplicity and it’s also masterful in how it builds its brand and public relations. It as the one that leaked that news, and of course it leaked in August and I think it might even have been a Friday. And so generally Google knows how to have bad news come out and it’s when most people aren’t listening. And then they almost always pair it with launching a new product or having a new great story about Google and it just drowns it out and most people miss it. And so that’s one of the unethical things that they do, is that they represent themselves to be this wonderful, ethical, moral legal company. They even say we abide by the law, we respect the law. And they don’t. Jason Hartman: It just reminds me of the number of times people try to do business with one of my companies or I’ve been at a seminar and the speaker is going on and on and on about how ethical they are. Usually those people are the ones you really have to worry about. Scott Cleland: You’ve learned well Jason, in a sense. And the real problem with Google is how sanctimonious they were, and literally how they build trust. Over a billion people use them. So most of the time, we have a practice where if somebody’s really representing you would expect that they would be who they represent themselves to be. That’s why we have deceptive practices that are illegal. Federal trade commission knows you can’t say something that’s untrue. And Google also has been found on promoting deceptive privacy practices by the federal trade commission and they have a 20 year decree where they’re going to be investigated and overseen on this. Because once again, they told Google buzz people they wouldn’t release their private information and when Google released Google buzz, they released everyone’s Gmail contacts. And that’s a problem, because one woman said look, my abusive ex-husband was able to track me down from that experience. So what they do, because they have a mission of organizing the world’s information, that means they want to organize your private information and any property they can get. And we should talk a little bit about privacy, because that’s a thing that would most interest your listeners. Jason Hartman: Absolutely. Well here’s the thing though. Before we kind of get into that, Google has also been criticized in another way. And maybe this is the way in which their currying favor with the government and that is that they’ve been criticized for being in bed with the government and sharing too much information with the government. And also they just changed their privacy policies and made them uniform across I guess all of their products. But nobody reads these things anyway. Talk about the angle of Google and the government if you would. And of course I’m talking about the US government. You’re welcome to talk about other governments. We certainly know about their debacle in China a while back, but I don’t know where to go with that one. It’s pretty complicated. Scott Cleland: Well Google is big brother Inc. and anybody that worries about big brother the government needs to worry because under the loopholes and US law, US government can and does get whatever Google has on people without a warrant or subpoena. So that should freak people out. We think that under the law you need to go to a judge and get a wiretap to get that information or to track somebody. For all the stuff on the internet, they don’t. And Google has vastly more intimate information than you’d ever hear from just conversations. And that was one of the things from my book, Search and Destroy: Why You Can’t Trust Google Inc. What I talk about is how literally they’re collecting all the world’s information. And it’s incredibly intimate. If people want to see it, if they Bing or Google “total information awareness power” in Google, they’ll find a chart of all the things that Google collects. And my view is, it’s not a free country if any entity, whether it be a private company like Google or the government, has an uber intimate profile, literally like the East German Stasi would have collected during the cold war. Because if you don’t have your privacy, if you don’t have some zone of privacy and protection and somebody knows literally everything about you. They own you and you’re not an individual, you don’t have your own dignity, your own safety, your security, your privacy or your family. Somebody else owns you if they know everything about you. In a free country you shouldn’t have that. Jason Hartman: You’re absolutely right. The Bill of Rights says that there’s no unlawful search and seizure but the problem is that the founders didn’t really know how to comprehend what would come 230 years later when we’re living in the age of information. This information is incredibly valuable and sensitive. And that is the new version of search and seizure. Scott Cleland: That’s a good segue. Did you know that Google wants to know what you want, what you think, what you believe, what you read, what you watch, what you intend to do? They know you better than your spouse and you parent. And that’s because they push the envelope of privacy in every way. They track you online, they can even track you when you’re not online. They eavesdrop on you, they read your Email, they photograph your house, they want to be your wallet. They even record your face print and your voice print. And the problem with that is that that could fall in the wrong hands. As we talked, it can go to the government. It could go to a hacker. It could go to a rogue Google employee or a government spy agency like China. All these things have already happened. And why your listeners should be worried about that, is what does it mean for them? If someone can access that, it makes them more in danger of stalking, black mail theft, fraud, kidnapping, arrest, intimidation, harassment, I can go on. If someone knows everything about you, where you go, who your friends are, who you’re associated with, it’s basically a recipe book of how to do bad things to you. And I the physical world we have kind of a zone of privacy because it’s hard and difficult to collect that much information on you. But online, basically the internet is a master recording and copying device. And Google has mastered it. Jason Hartman: No question about it. And what happens online translates into the physical world. If someone knows our shopping patterns, they know what we have in our home. They know what we have in our office because we bought it online. And if you talk about it in a Gmail and the ad is served up, they know what you’re looking at. It’s amazing in the free versions of that software, which I don’t use but I did many years ago, you type something in your Email and gosh if there isn’t an ad right next to it. It’s scary. Their computer is reading your Emails. No question. Scott Cleland: And the thing is why would Gmail, 350 million people use it, and it’s one thing for each of them to decide I’m going to give up my privacy and fill it out. But whenever they Email somebody else that hasn’t agreed to use Gmail, their private information is gathered by Google under that same situation. And that is open. Jason Hartman: Very scary. So Scott, if you have to pick the most dangerous force out there in the world of information gathering, is it really Google or is it Facebook? Scott Cleland: It’s certainly Google. But let’s look at Facebook for a minute. Facebook has privacy problems. They admitted it, and they’ve had repeated privacy problems. The thing is about Facebook though, is they are younger and they’re basically going to get captured and caught in a lot of the privacy issues. So they’re not going to be able to get to be the privacy invader and problem that Google already has become. And they also don’t have a mission to literally organize the world’s information, which includes all your private information. And remember Facebook is only a subset of what Google does. Google with Google+ and with Facebook, is just one piece of all the world’s information. So I don’t want to minimize Facebook’s problems are a problem but they say that 845 million people use Facebook, but it’s actually a much smaller number that use it regularly and the information they have, Google has vastly, vastly more information in every dimension than Facebook has. Facebook’s a sliver, Google is the whole pie. Jason Hartman: Right. Okay, interesting. Talk to us more about some of these conflicts of interest with Facebook, and I hope towards the end of this discussion today you’re going to tell us what we can do to protect ourselves, because if we were paying a membership fee to Google, say we were paying $20 a month to use all of Google’s products or something, that would be different. But what we’re paying with is our information. And people kind of don’t notice that. It’s sort of like the air you breathe, hopefully it’s clean enough to where you can’t actually see it. And this has this slippery slope effect that is very disheartening. Scott Cleland: It is. And let me start out once again saying advertising is a perfectly legitimate good business model as long as it’s obvious and transparent to people that that’s what’s going on. And with search, we’ve seen survey after survey after poll; people don’t know what Google is doing and that they’re the product and that their information is really what’s paying for all of this. And maybe they should, but a vast majority of the billion people that use it don’t. And what that says is they’ve been misled or Google hasn’t represented itself fairly. And that’s the ethical problem with Google. And it isn’t like Google doesn’t know this. The two founders when they wrote their PhD paper, identified that they didn’t think that search should be with advertising because the conflict would be too insidious, and that was their word, and too problematic. Jason Hartman: Well they apparently sold out on that, didn’t they? Scott Cleland: Right. Just for example, they just busted by the Australians for making their ads deceptive and that’s because everybody may not know that a lot of those sponsor listings that are at the top, they think they’re search results, are actually ads. And frankly, most people don’t know their ads. But Google said, wait a minute, there’s a little bit of difference in shade in grey, we say sponsored listing, everybody should know. But Google has known over time that they can don the minimum in order to cover themselves, knowing full well they’re being deceptive. And that’s throughout kind of the Google system, is they do the minimum. They tell the truth but not the whole truth, and nothing but the truth, if you understand what I’m saying. So the problem with them and their advertising and the conflicts of interest, they’re the most conflicted business that’s ever been invented. And if you have conflicts, you need to disclose them. And Google has just mountains of conflicts. And why do I say that? Because they are the world’s information broker. Literally all websites, advertisers and users come together and the black box of Google puts them together and monetizes it. And they don’t tell people who’s paying the bill or who’s doing it. And that’s the problem. If Google was forthright, obeyed the laws, was not deceptive in the way they marketed, I really wouldn’t have problems with them. But they are highly deceptive and duplicitous in the way that they deal with people. Scott Cleland: And it’s the information that you give and give away that is assembled, saved, and cross analyzed. Literally they know stuff about you , you don’t know about yourself by basically putting together your behaviors. And the scary thing about this is that in an election, or one of the things I say in my books and one of the things that everyone should be very aware of is Google supplies all their information for free or their services to all the campaigns. And so they know every candidate campaign party’s funders, their supporters, they know everything. They know where they are located. They know their hot buttons. Because if they’re going to sell you something through their ads, just like a product or service they can sell you an idea or a candidate. So Google has developed literally the capacity to influence elections or to throw elections. And the point, I just don’t think any company or any entity should have that much information on that many people. Now if in a perfect world, if they were perfectly ethical and they always obeyed the law, there would be less concern there, there would still be a lot, but they have proven to not obey the law and to be highly unethical, and to be highly political. So what I’m saying in the book is that it’s very scary when there’s this centralized power that Google has over information. And information is power and absolute power corrupts absolutely. And that’s where Google is. They have the motive and the capability to influence elections and manipulate elections. And I don’t think the right people are watching to make sure that they don’t. So a lot of what I’m talking about is Google just needs accountability. And our system of government, we brilliantly because of the founders have separation of powers. We have all sorts of rights that protect the minority or the individual. And in the virtual world and on the internet, which is where anything goes, Google has been able to assemble extraordinary disproportionate, monopolistic, totalitarian type potential power. And people need to know look, if there isn’t accountability, if there isn’t checks and balances on that, bad things will happen. It’s human nature, history, we’ve always known it. When there’s a centralization of power, bad things happen. Jason Hartman: Who would have ever thought that the world’s central planner would end up being an internet company? Most people think it’s governments you have to worry about. Scott Cleland: Well I’m glad you used that term because that’s what I called them in the end because they’re the ultimate central planners. Why do I say that? Well computer programmers and algorithm writers, remember a program, a computer program is designed to create what it wants to produce. Meaning it has an end result and then it automates how to get to that end result. And so everything they’re doing with information, everything they’re doing with monetizing it, everything they’re doing with all of their services, they know the outcome they want to get. So it’s a centrally planned company and a centrally planned ecosystem and almost sub economy. And they just say don’t be evil and everybody’s supposed to smile and say oh that’s fine. Jason Hartman: And you know what’s amazing? Governments and central banks have so much power over us because they control the currency; they control the value of the currency through inflation and deflation. Well mostly just inflation. Google now, they’re in the cash business. We look at PayPal. But Google with their product, I think it’s called Google Wallet, where you can pay for things with your phone. It’s going to be massively convenient, I’ll tell you that, so the adoption will probably be extraordinary. They’re in essence now controlling the world’s fiat currency. If you go to a vending machine and you point your phone at it and pay with your phone, they can create basically a cashless society. Scott Cleland: Yeah and I’m less concerned about Google Wallet in the competitive world because I think everybody’s getting into it and realizing that I think everybody doesn’t want Google. Even Walmart, Kmart, all the retailers in the world have gotten together and said we don’t want Google to be able to do this and they wanted to have their own. And there’s others, so there’s not as much concern there. But when you talked about the federal reserve, to give people an idea of how much information they have, the federal reserve, their relative is much more powerful than the federal reserve because Google is like putting 90% of all the central banks of the world together under one entity. There then you start getting a sense of it. Or it’s like 90% of anything in the country of information and power, that’s what they control. So it’s the internet is essentially Google’s domain. And people don’t appreciate that. They say the internet, in a sense they’re saying Google for most consumers. Jason Hartman: Let me take a brief pause. We’ll be back in just a minute. Narrator: Want to know what you’ve missed in the new creating wealth series? Well here’s your opportunity with Jason’s 5 book set. That’s shows 1-100 for digital download. So save $288 by getting this 5 book set. Learn all of the advanced strategies for wealth creation. For more details go to JasonHartman.com. Jason Hartman: When we look at Google, and you’re saying they’re highly political now. I doubt people would really think that because certainly I never hear of the founders of Google come out and talk about politics. I hear Warren Buffett talk about it. And Google certainly, their founders have got to be left leaning, right? Scott Cleland: Extremely so. But that’s their right. It’s a free country; they can have their political views. What people don’t realize is they are very activist in government with those political views and companies can be. But they are way more than most. And what makes it more troubling is that they also represent themselves as unbiased. That they don’t manipulate search results, they’re an unbiased like honest broker. And that’s a problem. Once again they’re saying we’re trustworthy. trust us we’re unbiased. And they aren’t. they have a very strong political agenda. One of the reasons I wrote the book is I think their radical left wing ideology isn’t accepted by the vast majority of people, whether you’re a democrat or republican, liberal or conservative. Most people believe in property rights for others and believe that people have a need for privacy. You put conservatives and liberals in there, they both want privacy, they just have a different boogie man they’re afraid of. But they all know if you don’t have any privacy, it’s big trouble. And what Google’s kind of radical philosophy is, is that it has this kind of techtopian society where everything will be best on the internet if there’s no property or private information. Where any one and zero is free to go wherever it wants to go. And most people around the world in the civilized world know that if you don’t have private property and if you don’t have private information, you are Google’s serf. Jason Hartman: Well just anything more? I want to ask you what we can do, but anything more on digital serfdom, the road they’re leading us down, and where Google is taking us? Just anymore on that before we talk about some action steps here. Scott Cleland: Yes in my book, Search and Destroy: Why you Can’t Trust Google Inc., this is really the first book about Google that is critical of them but it also talks about where Google is taking us. And I talk about in one chapter about the digital road to serfdom and it’s basically what I said before that if you don’t have privacy, you don’t have property, you aren’t really an individual, you don’t control your own destiny, someone else does. Some other entity does. [00:27:39] let us know that you have to have individual freedoms and you have to guard those so you don’t become a serf to some totalitarian entity of some type. But then what I talked about is really what it is all about, what Google is all about, is the tyranny of central planning. In the sense that they know what they want to do with all that information and they organize it so that it produces the outcomes they want. And we know that anybody that has centralized power of that extreme, everybody should be very concerned. So in my book, people say what do you suggest? I made some simple rules. I think people should expect them to follow the golden rule, because they don’t treat others the way they want to be treated. I think we should ask law enforcement to enforce the law. If you think you’ve been wronged, you should sue. And I think the one area where government needs to intervene in a legislative way is we need privacy legislation. There should be do not track, like everybody has do not call privileges. That’s because I think that if you want to sell your privacy to Google or to others, that’s fine. It’s a free country. But if you want to protect you, your children, your teenager, your spouse, you should be able to say wait a minute. I don’t want to be stalked. I don’t want to be tracked on the internet. And that’s just common sense. Scott Cleland: Yes. The thing is that if it was against the law to be tracking it and aggregating it, would it be perfect? No, but it’s kind of like when people abuse the do not call list, people report them, they’re discovered and fined big time. It’s an 80% solution. It’s not a 100% solution, but I’ll tell you 80% is a heck of a lot better than 0. Jason Hartman: Yeah, no question about it. What’s interesting is there’s a website, a search engine out there called Start Page. And I use it from time to time, but what’s interesting is that several months ago I noticed that Start Page now had this little Google logo on it and it said searches by Google. It’s basically using Google’s search engine I guess, but theoretically stripping off any of the identifying information. So you get all the benefits of Google’s great search technology, this is the pitch I guess, without any tracking. I want to ask you about action steps and what we can do, but is Start Page something we should all be using instead of Google? Scott Cleland: It’s vastly better than the alternative, Google. And just like using Bing, spreading your business around. Remember, the threat is that it’s centralized so you should just be aware. The thing is Google does a lot of good. It has a lot of good products. What I’m trying to say to people is don’t blindly trust them. I use Google search when I want to find something difficult to find. And if I’ve made the decision I’m willing to let Google know I was looking for that. But I don’t use them regularly. So it’s be smart, be prudent, know that this is an unethical company that has a problem with obeying the law. And they are information hounds. They want everything. So people should just be smart in saying I don’t want to give them everything about me. And they should be aware of whenever they’re doing anything online that is sensitive or private that they don’t want other people to know, they should just be really judicious about what they’re doing. Because Google is collecting that information more than any other entity. Lots of other entities are doing it, but nobody is doing it on the comprehensiveness global scale and efficiency and focus, and literally a mission to do it. So I would put Google in literally several solar systems bigger threat than most everybody else. Maybe Facebook is up there in the next category, but nobody has as much accumulated comprehensive information as Google has. Jason Hartman: What is our life going to look like in we’re going down this same path ten years from now? In internet time, that’s about 70 years, I’m making them dog years because it evolves so quickly. Are we going to have any privacy at all? Scott Cleland: Well the thing is if you look at every poll, and I track them all, people want privacy and the expect privacy. So there will be a real inflection point disconnect where enough bad things happen where people pass privacy laws around the world and Google has to adjust. And it will be brutal adjustment. So it’ll be an adjustment for Facebook as well. Because they basically have assumed that they can do anything that they want with anybody’s information and they’ve done it. And people are going to figure it out, rise up and say no. is that going to take 5, 10, 15 years? I don’t buy this saying that Google and others try and say, you lost your privacy, get over it. Well the people didn’t want to give up their privacy. It was taken from them deceptively. And I believe that justice turns slowly. I believe that the collective kind of democracy maybe moves slowly, but in the end people are going to rise up and say what you’re doing is not in my interest. If I have no privacy, I’m no longer an individual. I’m no longer safe, I don’t have any of my own dignity. Somebody could steal my information, my identity. They can fraud me, they can stalk me, they can endanger my family. It is just common sense that you need privacy. And any time that people think about it, they demand it. Jason Hartman: Well what is amazingly scary, and you probably know about this; I think it was the CEO of Google that said a couple of years ago in a media interview when asked, is it really right for you to be tracking people’s search around the internet? And he said, and I remember seeing this with my own eyes, and maybe it was on 60 minutes or something, I don’t know. But he said if what you’re doing is that secret, maybe you shouldn’t be doing it. And I thought what a dangerous ideology that is. Scott Cleland: Very dangerous. He said that to Maria Bartiromo on CNBC. I remember it very well. I’ve seen it over and over again. And the thing is everybody has a secret. The little old lady that makes apple pies for church on Sunday might be afraid that her neighbor knows that she only did tow pies and not three pies and she would be devastated if that secret information was known. And what I’m trying to say is that everybody has a secret but either they don’t want their mother to know this or their brother to do that because they’ll be jealous or whatever. The point is that everybody has a right to their own privacy. They know when information can get out that can hurt people. And it’s not unethical. It’s not illegal, it’s just some things you should be able to decide. Your faith, your relationships with other people, that should be private. It’s not stuff that a company should feel it has a right to know about you. Jason Hartman: Yeah I couldn’t agree more. And a heck of a lot more than that should be private too. So what do we do? Use Start Page, what else? Scott Cleland: Well the other thing is just spread your usage around and also be aware that Google can track you wherever you’re going on that so do not use Chrome browser, do not use Gmail, do not use, well you have to use YouTube, I’m not telling you not to use it but just be judicious about it. But you can use another Email service, you can use another browser. They work fine. You can use another search engine. It may be Start Page that uses them but try and wean oneself away from Google to the extent possible. And it’s not really possible to get completely away from them. They’re everywhere. Jason Hartman: Well that’s a realistic view of things certainly. Okay good well where can people get the book and where can people learn more? Scott Cleland: They can get it, thank you, it’s Search and Destroy: Why you Can’t Trust Google Inc.. They can get it on Amazon; they can get it on our website which is searchanddestroybook.com or they can get it on Apple’s iBook store or at Barnes & Noble online. So it’s available online at any of the major things, but if they want to see more material, it’s searchanddestroybook.com. Jason Hartman: Fantastic and just as a point of disclosure, when you go online to buy this book, Google will probably know that you purchased it. Scott Cleland: We don’t track on searchanddestroybook.com. That would be too hypocritical. Jason Hartman: I know. I just wanted to point that out though with Google. When people look it up they will probably know. Well Scot, keep up the good work. Thanks for doing this. It really is a public service what you’re doing. But also please write a book on Facebook next, because I think that’s a big one too that we really need to worry about. So really good advice here and thank you for doing it. Appreciate it. Scott Cleland: Thank you for your time and your interest Jason. When Disaster Strikes, What’s a Landlord to Do? Inflation’s Low – Is That a Good Thing?